Postcard US-2230025, sent to Taiwan on May 16, 2013, has since expired. 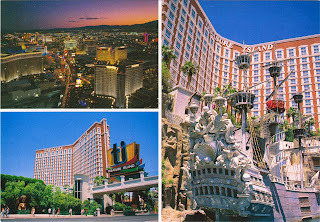 It shows an aerial view of the Treasure Island Hotel & Casino (top left); its "TI" sign at the entrance (bottom left); and the Sirens' ship "the Song" in the nightly "the Sirens of TI" show. In the show, a group of sensual and tempting Sirens battles with a band of renegade pirates.The Sirens first captures an overboard pirate, Eros, and lures his captain and crew into Sirens' Cove. However, the Sirens quickly find themselves under cannon fires from the pirate's ship "the Bull". Not for long, the Sirens overpower the pirates and sink "the Bull" to the bottom of the ocean. Nonetheless, as the pirates climb aboard "the Song" and a second battle ensues. In the end, the pirates realize that they are no match for the Sirens and decide to surrender. Then as the fireworks shoot from the hotel roof, it turns into a big party. The show will be temporarily closed from October 21, 2013 to December 25, 2013 as a three-story shopping mall is added to the resort site to host a CVS pharmacy, stores, restaurants, and an automobile showroom. The resort’s lagoon area will be reduced in size; and the pirate ship "the Bull", while not going away, will run on the shortened track.